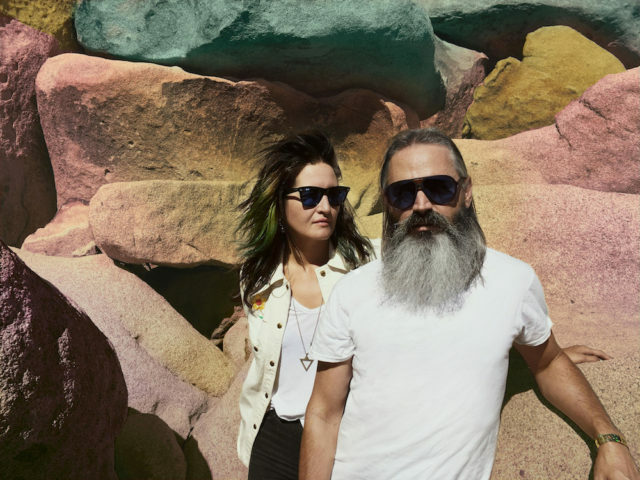 For as long as I’ve followed the band, Moon Duo has always created music that is dark, mystical and filled with substantial space rock drone. So it was with intrigue that I approached their new 2017 project, two LPs dubbed Occult Architecture Vol. 1 and Occult Architecture Vol. 2. The first was released by Sacred Bones back in early February. Volume 2 comes out May 5 on the same label. What I find so compelling about this pair of releases is the concept behind them, spelled out on a sticker pasted to the cover of Vol. 1. Part one of a two-part psychedelic journey from darkness to light. How could Moon Duo create music considered to bring forth light? This, to me, was a concept hard to get my head around. And it excited me nonetheless. “Lost in Light” is the first video to stem from Occult Architecture Vol. 2 and like the “Cold Fear” video that accompanied the first volume, it is illustrated. Compare the vibrant colors and major chords in “Lost in Light” above to the drone-filled darkness of “Cold Fear” from the first volume. Whereas “Cold Fear” was predominantly in shades of black, white and red, “Lost in Light” has vibrant colors and melodies that surprisingly spark joy for a band not typically known to do so. While “Lost in Light” doesn’t say it, I’m pretty sure both videos were illustrated and animated by Micah Buzan. Earlier this week, we got a second taste off the second volume, a track called “Sevens”. Like “Lost in Light”, Moon Duo’s “Sevens” is much more positive and welcoming. Justin Ripley’s vocals aren’t as melancholy as normal, and paired with Sanae Yamada’s backing vocals, Vol. 1 is poised to be downright happy. Even the percussion has a warmth to it, far from the band’s normal chill. Offering a cosmic glimpse into the hidden patterning embedded in everything, Occult Architecture reflects the harmonious duality of these light and dark energies through the Chinese theory of Yin and Yang…Vol. 2 presents the Yang. Yang means “the bright side of the hill” and is associated with the sun, light and the spirit of heaven. As such, Vol. 2 explores the light and airy elements of Moon Duo’s complex psyche. I’ve spent a fair share of time with Vol. 1 now, and I thoroughly enjoy it. Last night, the ten-minute album closer, “White Rose”, even received air time on my Friday night radio show at KSVR. Filled with sonic space-age keyboard and guitar drones and the occasional surreal psychedelic guitar solos, songs like opener “The Death Set” and “Cross-Town Fade” became quick favorites. But this is is one of those rare albums that truly stuns from cover to cover. It is holistic, a unified and cohesive work that flows effortlessly from one song to the next. Pretty sure we’ll see something very similar in Occult Architecture Vol. 2. Keep your eyes peeled for the second volume. Again, it’s out May 5 on Sacred Bones. Preorders are available now.